What does GER stand for? What does GER mean? 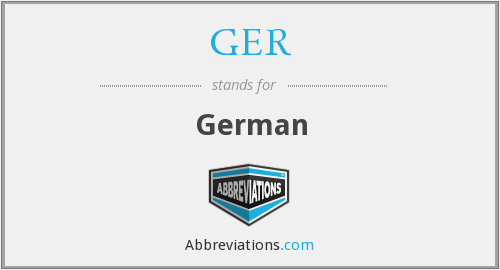 This page is about the various possible meanings of the acronym, abbreviation, shorthand or slang term: GER. Ger, or Gur is a Hasidic dynasty originating from Ger, the Yiddish name of Góra Kalwaria, a small town in Poland. Prior to the Holocaust, Ger was probably the largest and most influential Hasidic group in Poland. Today it is one of the largest Hasidic dynasties in the world. It is now based in Jerusalem. The rebbes who lead the movement have the family name of Alter. The founder of this group was Rabbi Yitzchak Meir Alter, known as the Chiddushei HaRim after his primary scholarly work by that title. Couldn't find the full form or full meaning of GER? Know what is GER? Got another good explanation for GER? Don't keep it to yourself! "GER." Abbreviations.com. STANDS4 LLC, 2019. Web. 22 Apr. 2019. <https://www.abbreviations.com/GER>.